Venus is the brightest planet and it is brightest this week in the evening for all of 2010. 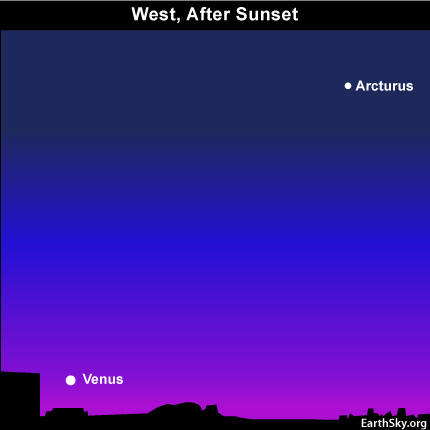 Look outside shortly after sunset and you cannot miss Venus. It is an eerie light low in the southwestern sky. Venus’ brightness will surprise you if you have never noticed it before. It is so bright that, around now, many people will report Venus as a UFO. 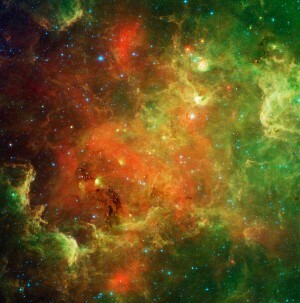 However, this is no exotic or unidentified object. It is simply our neighboring planet in orbit around the sun. On August 20, Venus passed a hallmark of its year when it appeared at its farthest from the sun on our sky’s dome. Right now, Venus is approaching its brightest – what astronomers call its greatest brilliancy – in the western twilight sky. Venus’ illuminated portion covers the most sky on September 23, the same date as this year’s September full moon. In the coming week, Venus will shine at its maximum brightness, at -4.6 magnitude. How bright is that? That is about 70 times brighter than Arcturus, one of the brightest stars in all the heavens – now in the same part of the sky as Venus. In you’re in the southern hemisphere – where Venus stays up for a few hours after nightfall – and if there’s still snow on the ground where you are, it might be possible to notice shadows cast on snow by Venus. You will have your best chance to see shadows cast by Venus once the moon leaves the evening sky later this month. So Venus is about at its brightest for the year now. Yet – in what seems like a paradox – a telescope would reveal Venus now as a waning crescent. It looks like a tiny, featureless crescent moon. Because the orbit of Venus lies inside of Earth’s orbit, Venus goes through phases, much like our moon. Surprisingly, Venus’ disk appears only 29% illuminated right now, as seen from Earth. How can it be shining at or near peak brightness when we are seeing only a portion of its lighted hemisphere? The answer is that – when Venus appears full as seen from Earth – it is always much farther away, on the far side of the sun from us. That is the only place it can be in order for its fully lighted disk to be facing our way. Full Venus = more distant Venus = fainter Venus overall. Venus is now on the same side of the sun as Earth. It will go between Earth and the sun on October 29, 2010. Therefore, a portion of the day side of Venus is turned away from us, and we see a crescent Venus. Still, Venus is on the same side of the sun as us, and therefore closer, a telescope would reveal the crescent. It would also show the crescent as being very large. Thus, Venus is brightest now. By the way, in the weeks ahead, Venus will be coming closer still to Earth, but it will be showing us less and less of its lighted hemisphere (day side) as it prepares to pass between us and the sun. So now is the time of maximum brilliance for Venus! Watch for it as a brilliant light looming low in the west after sunset.